I am very happy to have this opportunity to recommend strongly Millard Erickson's Who's Tampering with the Trinity? 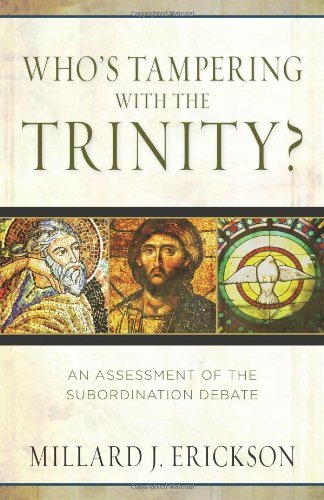 An Assessment of the Subordination Debate to the readers of Priscilla Papers and to the wider evangelical community in generaL Erickson's book addresses two areas of vital importance to the church: the doctrine of the Trinity and the role of women in the church and family. Erickson tackles the arguments of the "new evangelical subordinationists"1 who have been arguing that the Son is eternally functionally subordinate to the Father within the Trinity in order to bolster their arguments by way of analogy for the functional subordination of women in the church and in the family. In eight very balanced and carefully argued chapters, Erickson ( 1) considers the "gradational authority" view; (2) the historic, mainstream "equivalent authority" view in which the Son is not eternally subordinate to the Father, but only (willingly) subordinate to the Father during his earthly ministry; (3) the criteria for evaluating these views; (4) the biblical evidence; (5) church history, creeds, and tradition; (6) philosophical issues; (7) theological dimensions; and (8) practical implications for the Christian life and church ministry. The author's overall conclusion (257) is that the historic view of equivalent authority of the Father and the Son is "considerably the stronger of the two views and thus to be accepted over the gradational view." While Erickson allows that, while the "eternal functional subordination of the Son" view might be technically still within the bounds of historic, orthodox Trinitarian doctrine, he is concerned that, in the longer run, the idea of the eternal and necessary supremacy of the authority of the Father over the Son and the Holy Spirit will undermine historic Nicene orthodoxy (homoousios, "of the same essence") and ultimately lead to heterodoxy. Eternal and necessary subordination in function logically implies an eternal difference of nature in which function is grounded, and so undermines equality of nature in the Father and the Son. Erickson closes with a plea to the new evangelical subordinationists to reconsider their views, and to pull back from them: "Please think through the implications of your view, observe the body of evidence against it, and reconsider the idea of the eternal functional superiority of the Father over the Son and the Holy Spirit . . . . Go back. You are going the wrong way" (259, 258). The bishops, in their commentary on the Nicene Creed, make it clear that they believe that the Father and the Son have a "coeternal sovereignty" (basileias); there is no way that a "coeternal sovereignty" can be squared with the notion of an eternal subordination of the Son. A coequal and coeternal kingdom implies coequal authority and is contrary to any notion of eternal subordination of the Son. Anyone who does not say that the Son of God is true God . . . that he can do all things [emphasis added] . . . and is equal to the Father, is heretical. . . . Anyone who does not say that there is only one Godhead, one might, one majesty, one power, one glory, one lordship, one kingdom [emphasis added], one will and truth of the Father and the Son and of the Holy Spirit is heretical. Again, "one lordship" and "one kingdom" is clearly inconsistent with an idea of an eternal subordination of the Son to the Father. The Godhead of the Father, of the Son, and of the Holy Spirit is all one; the glory equal, the majesty coeternal (aequalis Gloria, coeternal majestas) . . . the Father is Lord: the Son Lord (dominus): and the Holy Ghost Lord . . . we . . . acknowledge every Person by Himself to be God and Lord (Deum ac Dominum) . . . and in this Trinity none is before or after another: none is greater, or less than the other ... but the whole three Persons are coeternal, and coequal (coaequales) . . . equal to the Father, as touching his Godhead; and inferior to the Father as touching his Manhood. . . . This creed expresses the critical distinction that became the hallmark of mainstream Trinitarian thought: the Father and the Son are fully equal in eternity, both as to nature and status and authority, while, in time, the Son voluntarily assumes a servant's position and lesser authority in the history of redemption (e.g., Phil2:5-8). Your attitude should be the same as that of Christ Jesus: who, being in very nature God (en morphē theou hyparkōn), did not consider equality with God (to einai isa theō) something to be grasped, but made himself nothing, taking the very nature of a servant, being made in human likeness. And being found in human appearance as a man, he humbled himself and became obedient unto death—even death on a cross! In the incarnation, Christ "emptied" himself of the divine glory and equality with the Father that was his by right and voluntarily assumed the stance of a servant. The subordination of the Son as "servant" was a voluntary act in time, not an eternal state within the life of the Trinity: the Son was not eternally a "servant" with lesser authority in relation to the Father. Then I saw a Lamb, looking as if it had been slain, standing in the center of the throne [en mesō tau thronou] encircled by the four living creatures and the elders. . . . Then I heard every creature in heaven and earth . . . singing: "To him who sits upon the throne and to the Lamb, be praise and honor and glory and power for ever and ever!" A text that has apparently not thus far received the attention that it merits in this debate is the Great Commission statement of the risen Christ in Matthew 28:18: "All authority [pasa exousia] in heaven and earth has been given to me." Christ does not say that some authority has been given to him, or much authority, but all authority. Christ can not be eternally subordinate to the Father as to authority, and at the same time truthfully claim that all authority in heaven and earth is his. It will not do to argue that the "giving" by the Father implies greater inherent authority. As Philippians 2:5 states, equality with the Father was the Son's by right; he shared all the divine prerogatives with the Father prior to the incarnation. Philippians 2:5, Matthew 28:18, and Revelation 5:6, 13 teach the Son's coequal authority with the Father before the incarnation, after the resurrection, and subsequent to the ascension, now and forever in heaven. Erickson astutely calls attention to some practical consequences of the eternal-subordination view, including one prominent evangelical hierarchist's startling conclusion that Christians should pray to the Father alone and not to the Son (227). Also to be considered in this debate are the missiological implications of this position. A Christology and doctrine of the Trinity that teaches the eternal subordination of the Son to the Father as to his authority would seem to undermine the Christian claims concerning the uniqueness and finality of Christ as the ultimate revelation of God in the context of world religions. If Jesus Christ eternally has lesser authority than the Father, then how can he speak with final and ultimate authority during his earthly ministry? Does this not play into the hands of apologists of other world religions in our pluralistic world? Could not the Muslim say, "Your 'eternal subordination of Jesus' view confirms what we have always said: your Jesus speaks as a prophet, but not necessarily as the final word of the true God, Allah—called 'Father' by you as Christians." A Hindu devotee of Vishnu or Shiva or Krishna might also welcome this view, saying, similarly, "Yes, indeed, we acknowledge your Christian Jesus as a 'god'—one of countless manifestations of 'God'—but, as you now seem to admit, not necessarily the final and most authoritative revelation of God—known to us by many names in the Vedas." In conclusion, I concur again with Millard Erickson's plea to the new evangelical subordinationists: "Please think through the implications of your view, observe the body of evidence against it, and reconsider the idea of the eternal functional superiority of the Father over the Son and the Holy Spirit. . . . Go back. You are going the wrong way." I would also echo the warning of Basil of Caesarea in his treatise On the Holy Spirit, 6.13-15: "What just defense shall we have in the day of the aweful universal judgment of all creation if . . . we attempt to degrade him who shares the honor and the throne, from his condition of equality, to a lower state?" Tampering with the historic, orthodox doctrine of the Trinity is, in my judgment, a dangerous and misguided way of attempting to defend a debatable position on the proper roles of women in the family and the church. 1. For example, Wayne Grudem and Bruce Ware. 2. Norman P. Tanner, ed., Decrees of the Ecumenical Councils (Washington, DC: Georgetown University Press, 1990), 28, or online, ewtn.com/library/councils/constanl.htm. Full citations of the historical sources in this section are given in my earlier article, "Incarnation, Trinity, and the Ordination of Women to the Priesthood," Priscilla Papers 24, no. 1 (Winter 2010): 9-18; see especially the section "Historic Trinitarian Orthodoxy: Eternal Equality of the Father and Son," pp. 12-16, discussing also Reformation creeds such as the Belgic Confession, the Second Helvetic Confession, and Augustine's comments on the Son's being "sent" by the Father. 3. In his commentary on this text, G. K. Beale notes that "God is mentioned as being glorified together with Christ to highlight that Christ is in the same divine position as God and likewise to be glorified"; The Book of Revelation (Grand Rapids, MI: Eerdmans, 1999), 365. Similarly, Stephen Smalley notes that, in this text, the Father and the Son". . . are joined together explicitly as objects of Christian worship; and this is a further important indication of John's high Christology . . . from now on, God and the Lamb will appear together as equals [emphasis added] sharing the same throne"; The Revelation to John (Downers Grove, IL: InterVarsity, 2005), 140.